Real Estate Sales Agent Exams in Indiana are administered by Pearson VUE exams at www.pearsonvue.com. Before registering for the Indiana Real Estate Salesperson Exam, make sure you have first completed the education requirements. Keep the proof of having passed your courses, since you will need it when you arrive at the test center on exam day. Below is a link to the Indiana real estate exam candidate handbook. Here you will find detailed instructions on how to register for the exam. The Indiana Real Estate Sales Agent Exam is broken up into two segments. The first segment is the real estate salesperson national exam. The second segment is the real estate salesperson state specific exam. 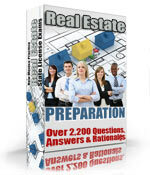 The national part of the Indiana Real Estate Sales Agent exam is comprised of 80 questions. A passing grade is 75%. That means that in order to pass the test, an examinee must answer 60 out of the 80 questions correctly. The state specific part of the Indiana Real Estate Sales Agent Exam is comprised of 50 questions. A passing score on this section is 75%, therefore, you must answer 38 questions correctly to pass. The time limit to complete the whole Indiana Real Estate Salesperson Exam is 4 hours. In Indiana, if you pass one part of the Real Estate Broker Exam, either the national or state section, but fail the other part, you are permitted to take only the part you failed at a later date, as long as both are passed within 1 year. The Indiana Real Estate Salesperson Exams are taken by computer. You will receive your results immediately after finishing the exam. The test is closed book, so leave your study aids at home. On your test day, make sure you arrive at least 30 minutes early. You should bring with you at least two forms of ID, proof you have completed the education requirements, and a simple functioning calculator. If you are retaking the exam be sure to bring the score report of the test that was failed. The registration fee to take the Indiana Real Estate Salesperson Exam is $57.